"For twenty years, the Palomas and the Corbeaus have been rivals and enemies, locked in an escalating feud for over a generation. Both families make their living as traveling performers in competing shows—the Palomas swimming in mermaid exhibitions, the Corbeaus, former tightrope walkers, performing in the tallest trees they can find. 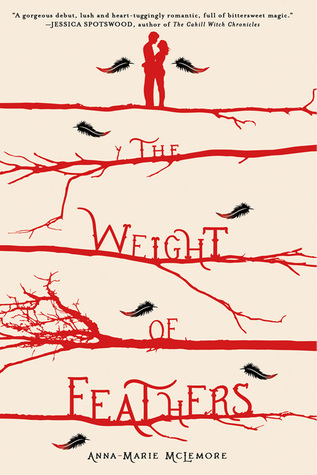 Beautifully written, and richly imaginative, The Weight of Feathers is an utterly captivating young adult novel by a talented new voice." Excerpt: THE WEIGHT OF FEATHERS by Anna-Marie McLemore. Copyright © 2015 by the author and reprinted by permission of Thomas Dunne Books / St. Martin’s Griffin. had yellowed. They snagged on antennas, turning the local stations to static. orchards on the edge of town. were not the Corbeaus’ skin. They didn’t hold the same poison as a Corbeau’s body. frescas so the brush wouldn’t catch. was an admission that, against them, Lace’s family had no guard. father traded homeschooling lesson plans with a troupe of Georgian folk dancers. The Corbeaus never traded anything with anyone. They shared nothing, took nothing. eye shining like a wet marble. and their mothers prayed they didn’t come home with broken ribs. that her escamas, the birthmarks that branded her a Paloma, had disappeared. nightmares made of a thousand wings. her hair, its slight weight like a moth’s feet. Lace’s cousins said the Corbeaus grew black feathers right out of their heads, like hair. a strong enough warning to keep Paloma children from the woods. bank and into the river, the hot metal hissing and sinking. 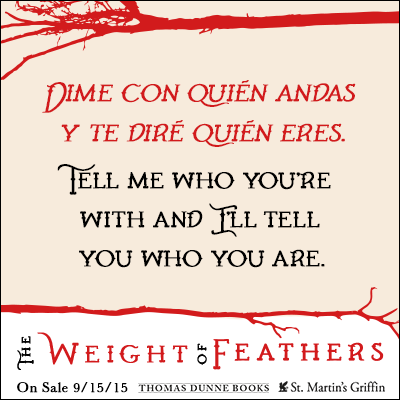 Giveaway: Thanks to the fabulous people at Thomas Dunne, I am giving away one copy of THE WEIGHT OF FEATHERS. This giveaway is only open to US and CA participants and ends October 3rd. Good luck, and may the odds be ever in your favor. "A modern-day Romeo and Juliet story in which a wealthy Southern boy falls in love with an undocumented Mexican girl and together they face perils in their hostile Georgia town. Evan, a soccer star and the nephew of a conservative Southern Senator, has never wanted for much -- except a functional family. Alma has lived in Georgia since she was two-years-old, excels in school, and has a large, warm Mexican family. Never mind their differences, the two fall in love, and they fall hard. But when ICE (Immigration and Customs Enforcement) begins raids on their town, Alma knows that she needs to tell Evan her secret. There's too much at stake. But how to tell her country-club boyfriend that she’s an undocumented immigrant? That her whole family and most of her friends live in the country without permission. What follows is a beautiful, nuanced, well-paced exploration of the complications of immigration, young love, defying one’s family, and facing a tangled bureaucracy that threatens to completely upend two young lives." Review: Two things I'm constantly seeking nowadays, in terms of YA novels, are originality and diversity. DREAM THINGS TRUE fits that bill. This is a novel that deals with current issues that will touch many hearts and leave readers wondering how many people must be going through this. First off, this is a novel about Alma and Evan- two every people with incredibly different backgrounds. While Alma must keep her family and situation a secret, Evan's life is all about fulfilling expectations. Both characters are incredibly flawed yet somehow blend well together into what I can only describe as this sort of awry perfection. Evan lives a life of privileged and as he gets to know Alma, he begins questioning his beliefs and thoughts. His upbringing is nothing like hers. While this is occurring, Alma is dealing with her own struggles, one of which being how to become close to Evan without revealing that she's an undocumented immigrant. What I loved about the novel is how it explored to very different classes and cultures. The Spanish included in the novel was a nice touch, though I often found myself google translating half of the dialogue (Hablo muy poco espanol- I think that's how you say it.). The writing was also another thing I adored. It felt flawless, so I found myself easily getting into the story and sticking with it. I actually finished this in one day. Now, the romance itself can be categorized in the insta-love category. It felt all-consuming, which gave me mixed feelings. Typically, I prefer relationships to build, but I also think teenagers are very much all or nothing when it comes to romance. I understood it from that perspective. The downfall is I do think the story line took a backseat to the romance. I would've liked the novel to focus more on Alma's family and situation and slightly less on her relationship with Evan. Overall, I really enjoyed this novel and recommend it to fans of Simone Elkeles. It's one I won't be forgetting anytime soon. I'm definitely look forward to seeing what the author has in store for us next. Evan led her onto the dock, where a dozen people she didn’t know were climbing into ski boats. She watched as all of these strangers, presumably students at her new school, casually distributed themselves into boats. Do teenagers own boats? Alma wondered. Evan led her onto his boat, where two other people were already rummaging around under the seats for life jackets. An athletic-looking girl with long brown hair threw her one. “I’m Caroline,” she said, “and that’s Logan.” She motioned toward a short, muscular guy with a shaved head. He had his back to Alma, and was untying ropes from the boat. Hearing his name, he turned and grinned. “¡Bienvenidos!” he said in terrible, Southern-accented Spanish. Evan got behind the wheel and started the engine. Just as he was backing out, an amazingly beautiful girl came running down the dock. “Evan, hon! Wait for me!” she called out. The girl reached the edge of the dock and, without hesitating, leapt gracefully across the water and toward the boat. She was wearing nothing but a bright-red string bikini. Her sandy-blond hair bounced and shone like a model’s in a shampoo commercial. Evan pulled her safely onto the boat, and she collapsed into the passenger seat. “Thanks, sweetheart,” she said to Evan. “But he loves me anyway!” Mary Catherine proclaimed. Then she smiled, revealing perfect teeth to match her perfect body. Were they flirting? 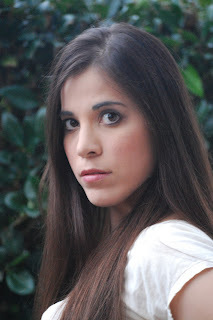 Alma felt a tightness in her chest, knowing that she was no competition for this girl. “You’re mocking me,” she called out above the noise of the engine. “I don’t think you even need a license to drive a boat,” Evan said. “No.” The wind pressed her back against him, and she felt the heat of his chest through the T-shirt. “Are you scared?” His lip brushed her ear as he spoke. “Yes,” she said. Her body was off balance, as if the floor of the boat were shifting under her. “Get over it,” he replied, lifting her hand gently and placing it on the throttle. Together, their hands guided the throttle forward. She tried looking across the lake, in the direction that he was steering, but all she noticed was his hand on hers. The floor kept shifting. She wondered if this was what it felt like to be drunk. He slipped out from behind her. She grasped the wheel hard to avoid falling back. The boat skittered over the water, and the wind fused Evan’s T-shirt to her practically bare skin. Alma tried hard to ignore the dull ache spreading at the pit of her stomach. After a few minutes, Evan took the wheel. Caroline and Logan both dived into the water and began to swim fast as Evan tossed a ski rope in their direction. “This should be entertaining,” he said as they wrestled with their slalom skis. Evan shoved the throttle forward and the boat lurched. “Yeah, I think it runs in his blood. Everybody says his dad was the same, back in the day. He stole boats and stuff, just for the hell of it.” He shrugged and continued, “Which is weird, since he’s the sheriff now.” The sheriff. Evan said it like it was nothing, like he was describing the color of Logan’s dad’s car, or his height—not like he knew this man had the power to throw people in jail and keep them there. Caroline was spinning in rapid circles as Logan did strange contortions with his arm. Maybe, Alma thought, they were all so used to being around powerful people that they didn’t even notice it anymore. Maybe they never had. Alma glanced at Evan and shrugged. She made her way back and settled into a bucket seat next to Mary Catherine. 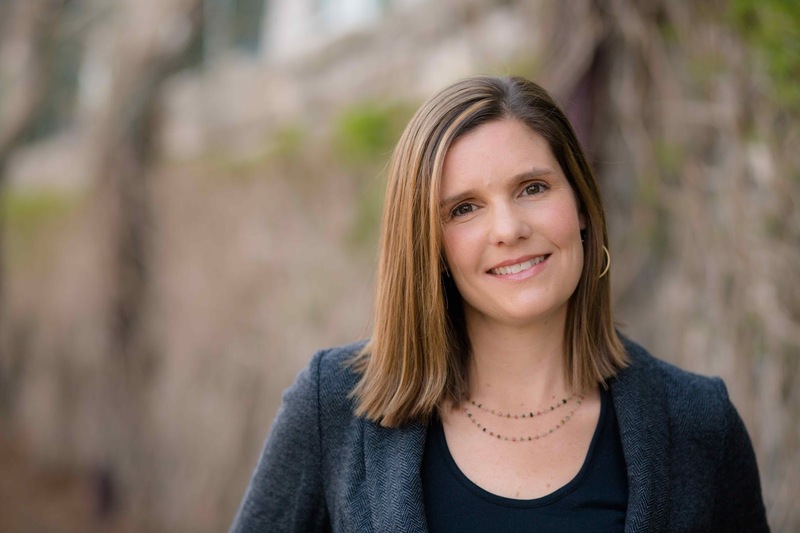 Catherine—or M.C., as Evan called her—was not your typical Southern belle. “So, when did you and Evan start hooking up?” she asked. For starters, she was excruciatingly blunt. “Uh, we’re just sort of friends,” Alma replied, shrugging. M.C. let out a deep, bellowing howl that sounded like it should come from a balding white guy with a beer gut. Alma was so surprised by M.C.’s laugh that she forgot to be embarrassed. Alma and Mary Catherine turned to look at Evan, his perfectly toned arms casually gripping the steering wheel, his broad shoulders gleaming in the sun. They both laughed, catching Evan’s attention. “What are you ladies talking about back there?” he asked. “Not unless Alma gets back up here to finish her driving lesson,” Evan said, reaching his arm out toward her. Mary Catherine laughed and nudged her out of the seat. Alma closed her eyes and stood up slowly, her head spinning and her legs quivering. 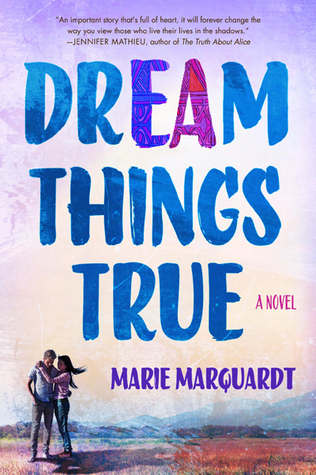 Giveaway: Thanks to the amazing team at St. Martin's Griffin, I am giving away one copy of DREAM THINGS TRUE. This giveaway is only open to US participants and ends September 30th. Good luck, and may the odds be ever in your favor.